Q68. 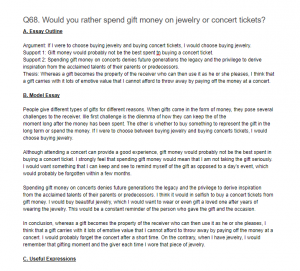 Would you rather spend gift money on jewelry or concert tickets? Argument: If I were to choose buying jewelry and buying concert tickets, I would choose buying jewelry. Support 1: Gift money would probably not be the best spent tn buying a concert ticket. Support 2: Spending gift money on concerts denies future generations the legacy and the privilege to derive inspiration from the acclaimed talents of their parents or predecessors. Thesis: Whereas a gift becomes the property of the receiver who can then use it as he or she pleases, I think that a gift carries with it lots of emotive value that I cannot afford to throw away by paying off the money at a concert. People give different types of gifts for different reasons. When gifts come in the form of money, they pose several challenges to the receiver. Ille first challenge is the dilemma of how they can keep the of the moment long after the money has been spent. The other is whether to buy something to represent the gift in the long term or spend the money. If I were to choose between buying jewelry and buying concerts tickets, I would choose buying jewelry. Although attending a concert can provide a good experience, gift money would probably not be the best spent in buying a concert ticket. I strongly feel that spending gift money would mean that I am not taking the gift seriously. I would want something that I can keep and see to remind myself of the gift as opposed to a day’s event, which would probably be forgotten within a few months. Spending gift money on concerts denies future generations the legacy and the privilege to derive inspiration from the acclaimed talents of their parents or predecessors. I think it would in selfish to buy a concert tickets from gift money. I would buy beautiful jewelry, which I would want to wear or even gift a loved one after years of wearing the jewelry. This would be a constant reminder of the person who gave the gift and the occasion. In conclusion, whereas a gift becomes the property of the receiver who can then use it as he or she pleases, I think that a gift carries with it lots of emotive value that I cannot afford to throw away by paying off the money at a concert. I would probably forget the concert after a short time. On the contrary, when I have jewelry, I would remember that gifting moment and the giver each time I wore that piece of jewelry.